To promote the new Mad Max video game coming out at the start of September, Uber teamed up with Warner Bros. Interactive Entertainment this weekend to give fans in Seattle real rides in real Fury Road vehicles. Through Monday (we know — not enough time, life isn’t fair, etc. 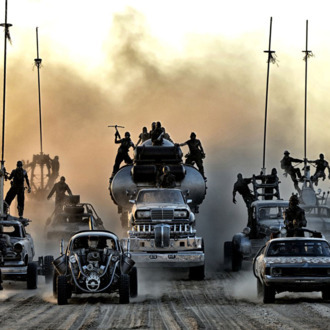 ), those going to and from the city’s PAX Prime gaming convention will have the chance to nab a varied set of postapocalyptic chariots that seat either one, three, or four other riders. Demand will be high and availability limited, the company notes, but if you’re lucky, you’ll be able to pretend that you’re Nux and can scream, “Oh, what a day! What a lovely day!” at all the other normal people riding in normal cars you encounter along your trek. Trips must begin and stay within downtown Seattle. The Wasteland is vast and gas is precious — the Warboys must remain near their Stronghold. Your dollars are worthless in the Wasteland. Payment shall not be required. Looks like it’s either time to go to Seattle, ASAP, or to start praying profusely to Valhalla that these Ubers make more of a national tour.